Republic, 12 Chapters, 1937. Starring John Carroll, Richard Alexander, Helen Christian, Duncan Renaldo, Reed Howes, Bob Kortman, Noah Beery Sr.
More than a hundred years after the masked avenger Zorro first rode in Mexico and California, a new Zorro begins riding in the same region. This modern-day masked avenger is a direct descendant of the original one–James Vega (John Carroll), part-owner of the California-Yucatan Railroad; like his great ancestor, he poses as a lazy fop when unmasked–much to the disgust of Joyce Andrews (Helen Christian) and her brother Phillip (Reed Howes), the railroad’s other owners. However, when masked as Zorro, Vega tirelessly battles the terroristic assaults on the California-Yucatan by outlaw leader “El Lobo’s” (Richard Alexander)–who, with his outlaw band, has been hired to force Vega and the Andrews siblings to sell the railroad to unscrupulous tycoon J. A. Marsden (Noah Beery Sr.). Zorro Rides Again was the historic first collaboration of directors William Witney and John English, and as such marks the beginning of the era that most chapterplay buffs–myself included–consider to be the Golden Age of Republic serials. Rides Again definitely got said Golden Age off to an auspicious start; it’s a fast-moving, action-packed, and very well-produced chapterplay. Zorro Rides Again’s screenplay–the work of Barry Shipman, Morgan Cox, Ronald Davidson, John Rathmell, and Franklin Adreon–is simple and somewhat repetitive in structure, but furnishes a more than adequate basis for the action scenes. 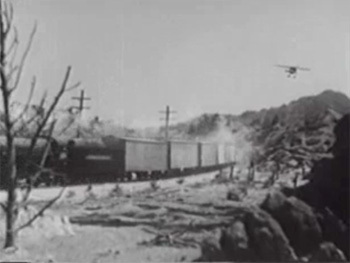 The writers manage to make the ongoing series of clashes between Zorro and the outlaws varied enough to minimize the repetition factor; the villains’ continual assaults on the payroll, construction supplies, or water sources of the railroad are neatly balanced with an attempt by the heavies to trap Zorro, a protracted tussle over a right-of-way deed, and a battle for control of the railroad company’s books and an incriminating letter. This variety, along with the swiftness with which both heroes and heavies move from one encounter to the next, keeps the viewer from feeling that the scripters are merely marking time till the final chapter. Above: Zorro makes his dramatic first entrance. The writers happily eschew the comic-relief characters that occasionally slowed the pace in many of the Republic outings that proceeded Rides Again (most noticeably SOS Coast Guard); although Vega’s servant Renaldo is involved in a few comic bits (his reaction to his first airplane flight, his encounter with his master’s golfing equipment), these scenes are quick throwaways, not time-consuming routines. The majority of the comedy in Rides Again come from the hero himself, not his sidekick; his languid unmasked pose–and the heroine’s frustrated reactions to it–furnishes several humorous moments, although even these are of a subdued nature. The scripters never do come up with any explanation for Vega’s adoption of a dual identity, however; since his Zorro is not wanted by the law, one’s left to assume he assumed the twinned hero/fop guise out of respect for family tradition. 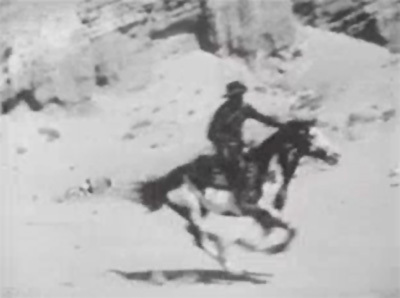 Zorro Rides Again’s action scenes benefit not only from the direction of Witney and English but from the cinematography of William Nobles and the stuntwork of Yakima Canutt (who doubles star John Carroll). The fight scenes are not as carefully staged as the brawls in later Witney/English outings would be, but are far better than those in contemporary Universal serials–or in most earlier Republics–thanks to the convincing straight-from-the-shoulder blows thrown by Canutt and his fellow stuntmen (Duke Taylor and Loren Riebe, among others)–and to the stunt team’s equally convincing reactions to said blows. The combat between El Lobo and Zorro by the railroad track in Chapter Three, the brief fight on the guard platform at the dam in Chapter Eight, and the subsequent tussle in the dam’s control room are among the best of the serial’s fistfights. 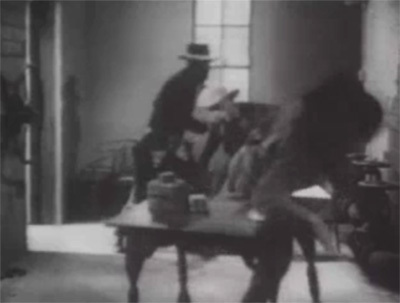 Above: A shot from the longer of the two Chapter Eight fights; that’s Bob Kortman (or his stunt double) who’s just been sent reeling towards the camera by Zorro. Although the fights are respectable, they’re not the serial’s primary source of action; shootouts and chase scenes (uniformly excellent ones) are far more numerous here. The villains’ aerial bombardment of a moving train in Chapter One—very well photographed by Nobles– is a definite highlight, as is the massive, high-casualty battle at the rail camp earlier in the same chapter . Other standouts include the horseback chases across steep terrain in Chapters Two and Four, Zorro’s spectacular invasion of the villains’ fort in Chapter Six (which has the hero riding downhill on the underside of a dynamite-laden wagon), and the last chapter’s violent large-scale attack on the villains’ mountain stockade, with Zorro making a daring capture of the heavies’ cannon to turn the tide of battle against them (this last sequence is easily one of the best climaxes in any serial). Above, top left: The airplane attack on the train. Top right: Zorro rides his horse downhill to cut off a fleeing henchman (Edmund Cobb). 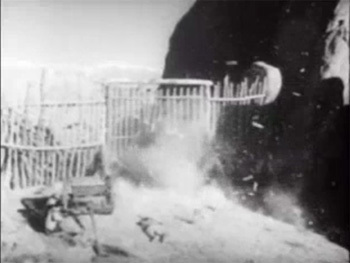 Bottom left and right: Zorro breaches the villains’ gates with their own cannon in the final battle. 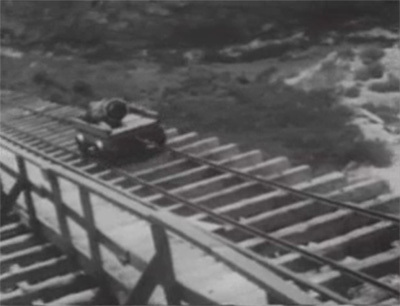 Another standout action scene is the chase at the endangered dam in Chapter Eight, which concludes with a good cliffhanger scene that has Zorro riding a little railcar down a steep track to apparent destruction. 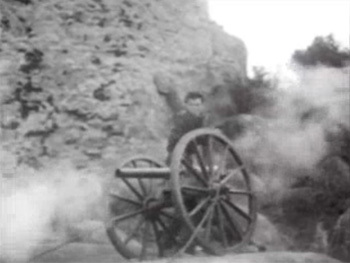 The real-life Pacoima Dam in the San Fernando Valley serves as the (spectacular) backdrop for this sequence; Iverson’s Ranch (Republic’s favorite outdoor location) and the imposing Red Rock Canyon area are used in most of the riding scenes; Bronson Canyon serves as the setting for the attack on the rail camp in the first chapter. Republic’s Spanish fort, hacienda interiors, and Western town are also on hand; the latter is raided en masse by El Lobo’s gang on multiple occasions, in action scenes that are quite exciting–despite their heavy use of stock footage from Republic’s John Wayne B-western The Lawless Nineties (in which, ironically, the attackers were the heroes, not the heavies). 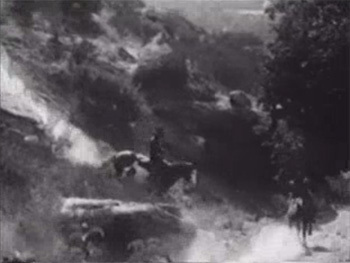 Above left: A battling Zorro and El Lobo roll down a hillside at Bronson Canyon. 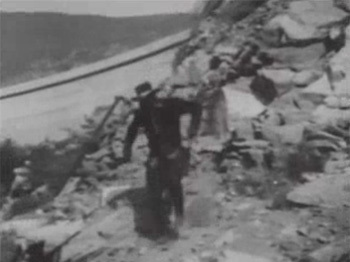 Above right: Zorro runs down the rocks in front of Pacoima Dam. 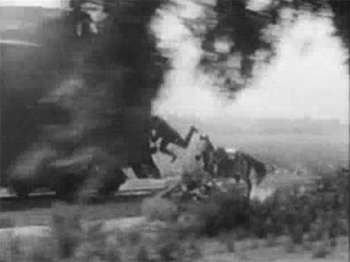 Zorro’s race to warn a train of imminent disaster in Chapter Nine–during which he hangs off the side of his horse to convince his villainous pursuers he’s been shot, then transfers from his steed to the moving train—is yet another action highlight, as is Zorro’s horse-to-truck transfer in Chapter Eleven (these bits of equestrian derring-do are performed by Yakima Canutt, of course). Canutt makes good use of his bullwhip expertise as well, although not as frequently as in The Vigilantes Are Coming; his skill with the weapon provides Zorro with a plausible but nifty-looking method of escaping from perils like the rail-switch cliffhanger at the end of Chapter Three or the burning-building sequence that closes Chapter Seven. 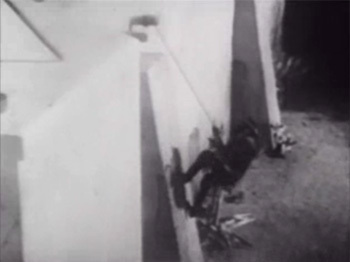 Above: Our hero scales a wall with his whip (left) and leaps from his steed to a train (right). 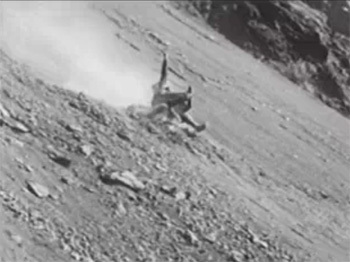 Those Chapter Three and Chapter Seven endings, due to their effective staging and their inventive resolutions, rank as two of the serial’s best chapter endings; the aforementioned Chapter Eight slide down the track at the dam is also excellent. Several of the other cliffhangers, like the plane crash that concludes Chapter Five or the tunnel explosion at the end of Chapter Nine, are good–but are resolved with the “survival” cop-out more common to Universal outings than to Republics. Incidentally, Zorro Rides Again features unusually lengthy “playbacks” of the cliffhanger buildup footage at the beginning of each new chapter; it sometimes takes as long as five minutes for the viewer to get to the resolution of the preceding episode’s peril. This can be a little irritating if one is watching more than a chapter at a time, but it’s a more acceptable method of prolonging the serial’s running time than the multiple flashback chapters utilized in many Mascot outings and a couple of other late-1930s Republics. Above: Zorro races to apparent destruction at the end of Chapter Eight. 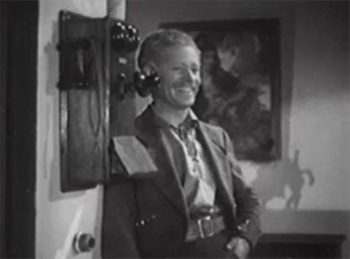 John Carroll—who later enjoyed a respectable career as a star or co-star in Republic A-features like the John Wayne war film Flying Tigers—is a dashing and charismatic lead; he makes his Zorro seem wryly humorous (when teasing the heroine with his indolent pose), sternly authoritative (when confronting El Lobo and his men), and suavely intelligent (when conning Marsden out of needed railroad supplies). The Spanish accent he affects when masked is a little overdone at times–but does serve the purpose of making the other characters’ inability to penetrate his dual identity more believable. Above: John Carroll as James Vega confidently practices his whip-handling skills. Above left: Richard Alexander. 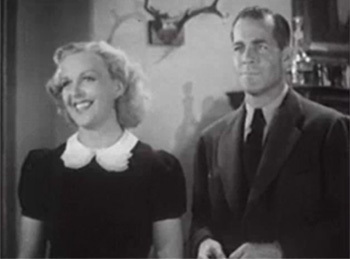 Above right: Noah Beery Sr.
Helen Christian is a pretty, poised, and self-assured heroine; she has fairly little to do, but handles her character’s outbursts of righteous indignation (over the villains’ depredations or Vega’s apparent sloth) with plenty of energy; the square-jawed and tough-voiced Reed Howes (a former leading man) is well cast as her doggedly determined railroad-builder brother. 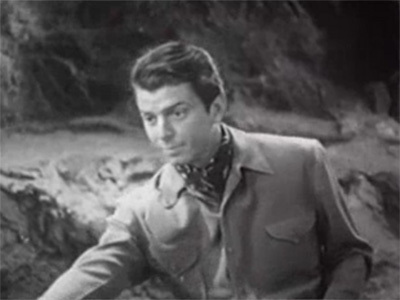 Duncan Renaldo—made up to look about thirty years older for his “faithful servant” part—makes a very likable sidekick; although his excitable and talkative character has his comic moments (as mentioned above), he’s far more helpful than fumbling, serving as a reliable confidant and assistant for Zorro throughout the serial. Above left: Duncan Renald. Above right: Helen Christian and Reed Howes. 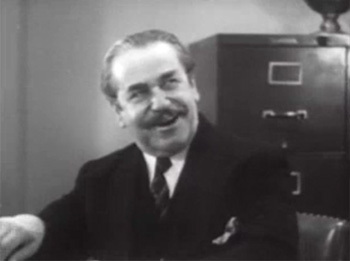 Bob Kortman, as Richard Alexander’s right-hand man, grins creepily, growls out his dialogue in typically menacing fashion, and receives some memorably villainous moments (like his brutal shooting of a small boy in Chapter One). 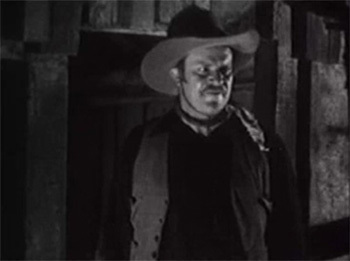 Jack Ingram—in his first notable serial role—is the Number Three henchman, but has few lines and does little more than back up Alexander and Kortman; Jerry Frank, as the heavies’ pilot, has a slightly larger part. Roger Williams and Al Taylor play other recurring henchmen, and Ray Teal and Edmund Cobb have noticeable bits as a pair of saboteurs. 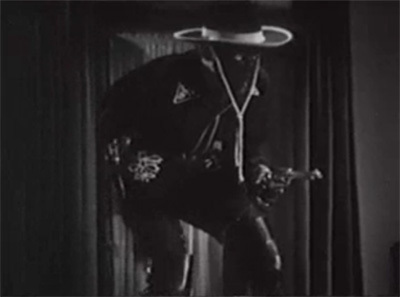 Once-prominent silent actor Nigel De Brulier brings plenty of patriarchal dignity to his role as the hero’s uncle, Don Manuel, dramatically recalling the heroism of the original Zorro and proudly standing up to El Lobo’s gang before his moving death scene midway through the first chapter. Hector Sarno is another dignified Don, while Lane Chandler, Harry Strang, and Tom London appear as rail-crew members, and Mona Rico plays Duncan Renaldo’s niece—a cantina singer who indulges in two renditions of “Cielito Lindo” (neither of which, fortunately, is long enough to slow the action down). 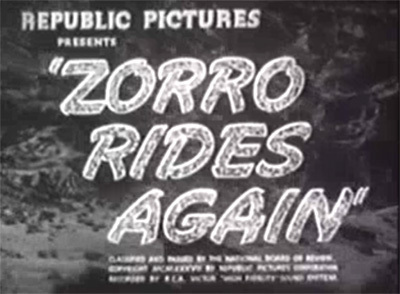 “Lindo” is not the only song in the serial; John Carroll (who possessed a fine singing voice) is given three opportunities to belt out a ditty called “Zorro Rides Again” (written by Eddie Cherkose, scored by Alberto Colombo)–which, unfortunately, sounds more like a comic-opera tune than the swashbuckling ballad it’s supposed to be (“I laugh at life through storm and strife/With mighty grip I crack my whip….”). The rest of the serial’s score is much better, with Colombo contributing a memorable central theme—light-sounding, but strong and insistent—that matches well with Zorro’s many horseback races to the rescue. Minor imperfections like the title song aside, Zorro Rides Again is a first-rate chapterplay, not only notable for its historical importance as the first Witney-English serial, but for the tremendous entertainment value it provides. Although the ensuing years would bring many further refinements to Republic’s serial-making formula, the stuntwork, cinematography, location shooting, and direction in Rides Again make it more than able to stand comparisons with the increasingly polished outings that followed it. This entry was tagged Bob Kortman, Duncan Renaldo, Edmund Cobb, Jack Ingram, John English, Noah Beery Sr, Republic serials, Tom London, William Witney. Bookmark the permalink. Happy New Year!….This serial is in my collection on cassette.Though not in my top ten, I found it to be enjoyable thanks mainly to the points brought out in this revue. Ranks *** out of *****. I first saw Zorro Rides Again when it was released in the 30’s (I’m 85 now) and loved it then as I do now. In fact I used to travel the two miles to the next town that was showing Zorro since my hometown theater didn’t carry it.It cost me ten cents for the bus ride. I usually walked home since that was my allowance for the week. Years later when I was doing some film editing on 16mm film, I cut the chapter endings and beginnings and made it a continuous movie that ran for some two hours, unlike the one Republic released in 1959. I’ve just recently finished a novel adaptation of the serial. Fun to do and soon will be available.as a novelette. I’ve quoted you on some of your review comments on the serial and included my own. Will keep you posted when it’s available.